So, I decided last year to give them experiences. Basically, it goes like this: I ask each of them to come up with a list of (a) cool places in Ohio that they’d like to visit (b) fun things they like to do (i.e. ice skating, amusement parks, etc.) and (c) where they like to eat. Then we go through the list together, come up with a compromise and go! Some things get eliminated from the list if they are too expensive (my option). Some things get eliminated if they aren’t a good fit for everyone—(i.e. my nephews would never go for a day of mani/pedis and shopping … much to the chagrin of my niece and I). This year, I think I’ve found a crowd pleaser that will make everyone happy. Actually, I found it without leaving my desk at work. It’s close-to-home. It’s inexpensive, all packaged up and ready to go. (And it helped that—as part of my job—I helped to create this fun getaway for visitors.) 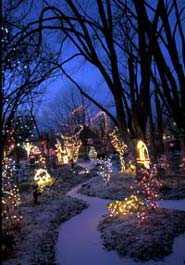 The official name for the package is Kids Go Free-Columbus Zoo Wildlights Getaway. The official details of the package are: (a) It can be booked online Nov. 20-Dec. 31 (b) It includes an overnight stay at a choice of Dublin (OH) hotels (c) It includes free kids passes to Wildlights at The Columbus Zoo (d) It includes a free kids meal at Bob Evans and a free junior scoop for kids from Graeter’s Ice Cream. The unofficial reasons why I would book one of these packages? (a) The cost of the packages with hotel and Zoo tickets starts at $79 for a family of four. (Yes, you read that right.) That’s less than I would’ve spent on their combined Christmas gifts. (b) Staying at a hotel is WAY more fun than just driving to the Zoo, going out for dinner and ice cream and driving home (i.e. SLUMBER PARTY!, swimming etc.) (c) Contrary to popular belief, Dublin CVB staffers don’t get stuff for free. But my biggest motivation is completely selfish. After I last planned one of these experiences, my 6-year-old niece gave me a hand-written thank you note that said, “Ant Mimi … you are the bast Aunt EVAR!!!!!!! !” This year, I’m gonna top that.